To take the pulse of graduate students, their dean solicits their feedback – one breakfast at a time. 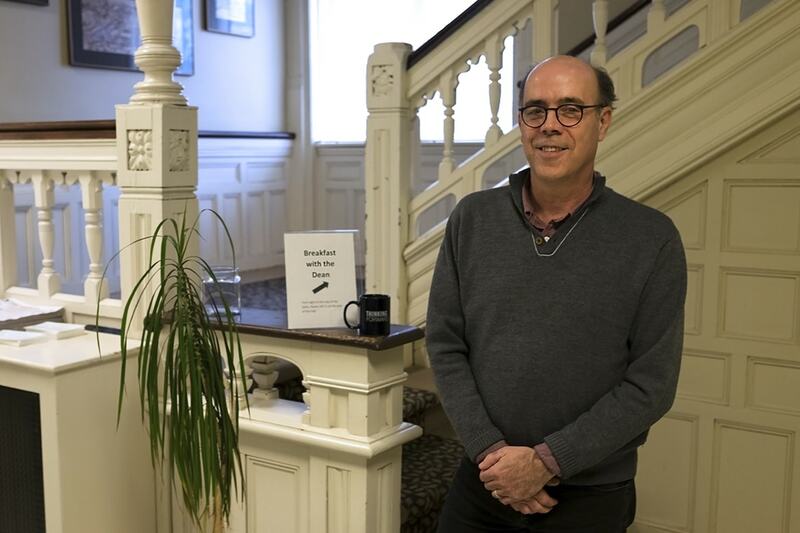 "A big piece of this is to let them know that this is a welcoming place, and that they can come to us," he said Tuesday after hosting three social science and humanities students. The meetings have helped Rowe and staff at the School of Graduate Studies learn more about students' concerns – like funding, challenges with supervision and time to complete their degrees. After many students asked for more access to student services, the school announced a summer gym bursary for graduate students who want to work out at university facilities. The bursary covers May-August memberships at Hart House and up to 100 per cent of summer fees at other athletic facilities across the university. "This will make a big difference," said Hervé Saint-Louis, a PhD student in the Faculty of Information who goes often swimming at Hart House. "It's when you're finishing a draft of your dissertation that you need to go the most." He had rarely set foot in the School of Graduate Studies before having breakfast with the dean and two other doctoral students, Branden Rizzuto in anthropology and Marie McLeod from U of T's Ontario Institute for Studies in Education. "I think the breakfast is a good idea," said Rizzuto, who is an executive in the Graduate Students' Union. "If you're going grassroots and have students coming from a variety of backgrounds, you're going to be exposed to a breadth of suggestions, problems, issues – and even positive aspects that you might not see with a top-down approach." After international students at the breakfasts said they weren't aware of resources available to them on campus, the School of Graduate Studies rolled out an international portal on its website, consolidating information about the resources and services for international students across the university's three campuses as well as offering pre-arrival tips. After breaking bread with students, Rowe sometimes takes them on a tour of the building next door, the newly renovated home of the School of Graduate Studies' Student Services. Once the residence of Sir John A. MacDonald, the building reopened last fall with a new graduate student lounge and oral examination rooms equipped with state-of-the-art technology. Student groups can now book these rooms for their own meetings, holding dissertation writing groups and other activities that require a quiet space. Among other initiatives, there is now a full-time wellness counsellor and coordinator, who sees students by appointment five days per week. The counsellor also leads free wellness workshops for grad students twice a month at 65 St. George St.
Also on the mental health front, the school worked with the Graduate Students' Union and Conflict Resolution Centre to create supervision guidelines for graduate students, helping them make the most of their time at U of T and relationship with their supervisor. Rowe hopes the students leave the breakfasts with food for thought. "I hope that they know we're listening to them, and that they get a better understanding of all the School of Graduate Studies has to offer them."